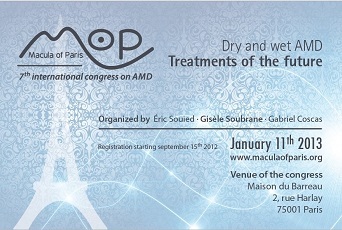 Dr. Jordi Monés, the Foundation’s Director, and three members of the BMF’s Scientific Advisory Board will attend the 7th International Congress on Age-Related Macular Degeneration (AMD), to be held tomorrow in Paris. This small, select and prestigious event periodically reviews the latest breakthroughs in macular disease research focussed on degenerative pathologies and particularly on atrophic AMD. Three prominent members of the Foundation’s Scientific Advisory Board will participate at the event in its various sections: early Friday morning, Giovanni Staurenghi, the President of the Ophthalmological Society Lombard, will give a talk on the general characteristics of AMD in which he will concentrate on the main morphological results of the most recent studies to be published on the disease. Taking over will be Dr. Jayakrishna Ambati, professor of Physiology and Vice-Chair of Ophthalmology and Visual Sciences at the University of Kentucky, who will review the main therapies in GA during a discussion on specific treatments for atrophic AMD. Finally, Dr. Barry Kuppermann, Professor and Head of the Retina Service and Vice-Chair of Clinical Research at the Gavin Herbert Eye Institute of the University of California, will base his talk on the results achieved by Ranibizumab according to the latest studies published. This is undoubtedly an excellent opportunity for the foremost international experts on AMD to exchange ideas for helping the 25 million people worldwide who are affected by this disease today.